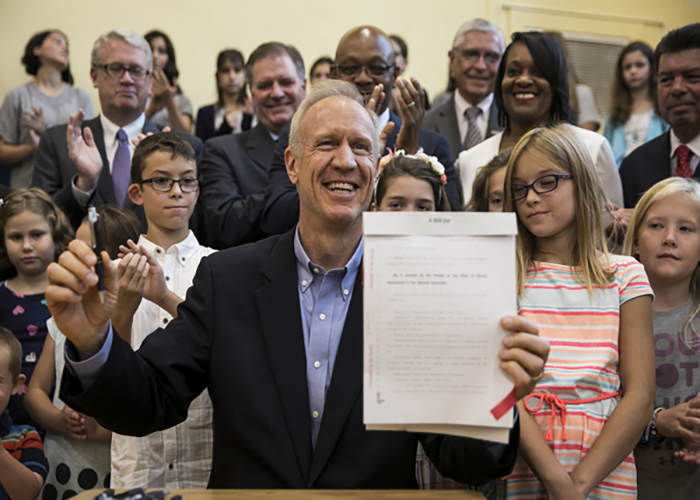 RAMBUNCTIOUS RAUNER: Holding a newly signed law, Governor Bruce Rauner smiles. Rauner passed a new budget for Illinois that included cutting P.E. requirements in public schools. In an attempt to reduce costs in school districts, Illinois passed a new legislation in Aug. of 2017 changing the budget for Illinois schools, according to the Chicago Tribune. One component of the law reduces the number of days Illinois students are required to take physical education from three days to five days per week. Still, the new law will not affect P.E. requirements at South, according to Principal Dr. Lauren Fagel. According to Stephen Stanicek, instructional supervisor for physical education, the law has not been interpreted yet, so most districts have not made any large changes. “The [more specified] language is going to come about sometime in May, and then that will provide time for districts to interpret it and then it’s really up to the districts to decide what they want to do,” Stanicek said. Despite the new law, Fagel says this law will not change the amount of time GBS students spend in P.E. “Because we are on the block schedule, our kids already take P.E. two or three days a week, so we are not considering any change,” Fagel said. Stanicek states that the GBS P.E. program will actually continue to progress by giving students opportunities to reach their goal of losing weight, being a performance athlete or increasing strength levels. “Our administration and our school board completely support our P.E. program,” Stanicek said. Another component of the new legislation concerns the ability to waive P.E., according to Fagel. According to sophomore Josie Sobecks, who participates in gymnastics and softball, a P.E. exemption would give student athletes without an SRT time to get their homework done during season. Fagel said the legislation also opens up the ability for students who participate in physical activities outside of school to waive P.E. “The law also says districts can decide to waive students from P.E. who are participating in a sport extracurricularly, so not just…a school sport,” Fagel said.